Equality Health has partnered with Allwell from Health Net to create a unique partnership providing culturally sensitive and effective care to Hispanic seniors through Allwell, a Medicare Advantage (MA) plan. Equality Health and UnitedHealthcare launched a new program to improve the quality of health care for people enrolled in UnitedHealthcare’s Medicaid plans in the Phoenix area by promoting a team-based, holistic approach to patient care. 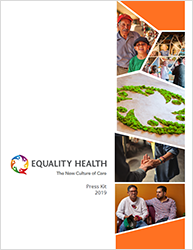 Equality Health, an Arizona-based organization pioneering health care delivery to underserved and diverse populations, announced it has appointed Tony Astorga to its Strategic Advisory Board. Astorga joins a respected panel of national and local professionals from a broad range of health care sectors and community leaders in aiding Equality Health with strategic planning and consulting. Equality Health is proud to announce its sponsorship of the National Council of La Raza Annual Conference in Phoenix this weekend. The National Council of La Raza began in Phoenix and holds a common theme and community connection with Equality Health. With its shared vision and focus on the importance of culturally competent care, it was a natural fit for our team to get involved to support NCLR’s efforts in promoting and advancing health and well-being for Latinos across the United States. Hugh Lytle, founder and CEO of Equality Health, was selected as a finalist in the 2017 Ernst and Young Entrepreneur of the Year in the healthcare category.